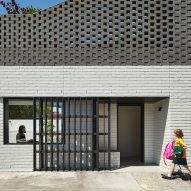 Australian studio Make Architecture has added a brick extension to a Victorian cottage in Melbourne that bounds the street on one side and curves around a secluded courtyard on the other. 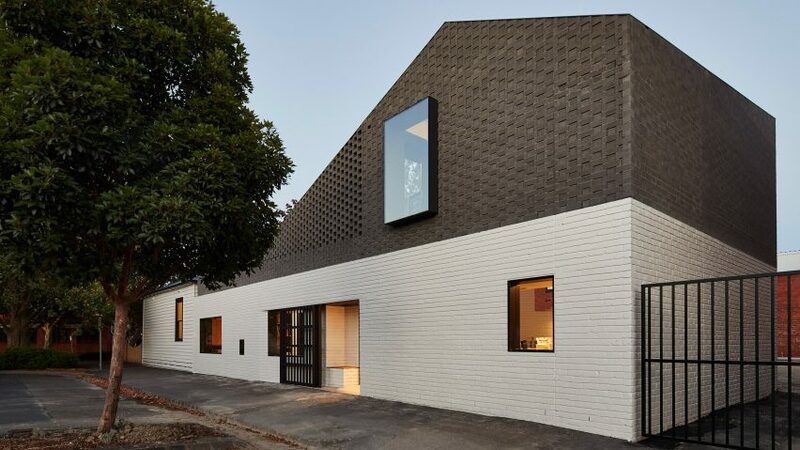 Perimeter House is situated on a plot within the industrial neighbourhood of Abbotsford, which contains brick factories and warehouses that influenced Make Architecture's choice of forms and materials. 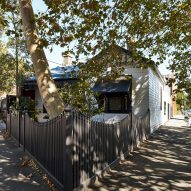 "With its existing heritage cottage at the site's southern end and its industrial use overlay, this new addition is driven by ideas of opportunistically working with the sites unusual and charged conditions," said the local studio. 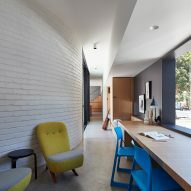 The extension is positioned along the western perimeter of the site and to the north of the existing building to ensure the new kitchen and dining area receive northern sunlight. 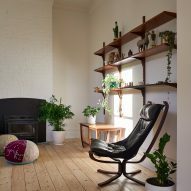 A corridor connecting a lounge in the cottage with the new spaces contains settees, shelving and a desk that help this circulation area to function as a study and additional living space. 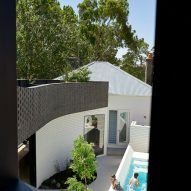 Its inner surface is lined with sliding glass doors that open onto the courtyard with its integrated pool and fireplace. 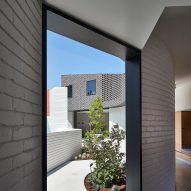 An entrance set into this new facade is recessed to emphasise its separation with the street. 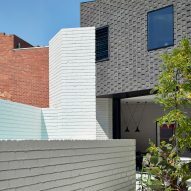 The lower portion of the elevation features white-painted brick that echoes the weatherboard cladding of the cottage. 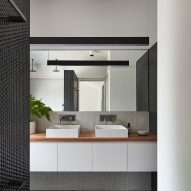 The upper level is formed from black-painted brick laid in a pattern that gradually opens up to create a perforated screen lining a rooftop terrace. 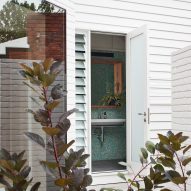 This decked garden is accessed from the stairs that ascend from the kitchen to the new main bedroom. 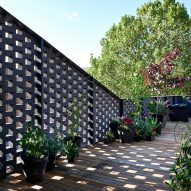 It contains potted plants and offers views of the canopies of surrounding mature trees, as well as down into the courtyard through the perforated brick. 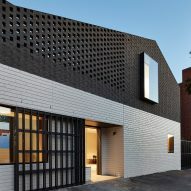 Brick was used to enhance the connection between the building and its surroundings, with the black upper surface in particular referencing the area's industrial heritage. 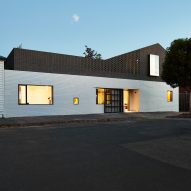 "The relationship of the house to its context is sympathetic and yielding as well as inventive and opportunistic," said Make Architecture, which previously added an extension featuring decorative timber cladding that references brickwork to a property on the city's outskirts. 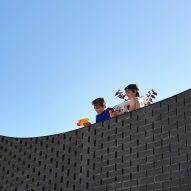 "Through its form and its program, the new house is a celebration of the busy context of industry and of brick factories and warehouses," added the studio. 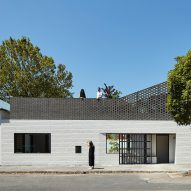 The building aims to balance this industrial aesthetic with references to its residential use, which is achieved through the inclusion of the pitched roof and the positioning of openings in the facade. Internally, the new living areas all look out onto the sheltered inner courtyard, enhancing the sense of privacy within these spaces.